The third event in the series drew in the largest crowd to date. Photo courtesy of the Partnership for Haddonfield. Attendees at the March 30 “Night Market” marked the largest to date. Downtown Haddonfield’s third “Night Market” Food Truck event on March 30 saw record crowds of hungry visitors to downtown. Hungry attendees lined up to try the fare created by the food trucks’ chefs. With 15 trucks parked along Kings Highway, the third “Haddonfield Night Market” delivered more choices over a longer stretch of the downtown than the first and second events that took place in September and November 2016. The food carts spread out along Kings Highway from Haddonfield Borough Hall to the PATCO Speedline and served a range of international and homestyle menu offerings including pierogis, savory waffles, tater tots, spicy meatballs and more. The Haddonfield Night Market also took place during “Late Night Thursdays,” which is when participating Downtown businesses and restaurants stay open late. 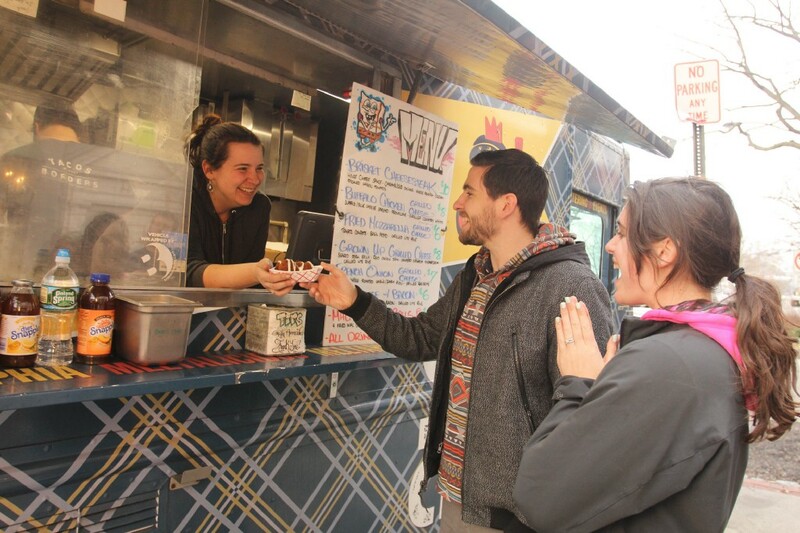 “Our third food truck event exceeded our expectations of being bigger and better,” said Remi Fortunato, retail recruiter for the Partnership for Haddonfield (PfH). Live music was provided by Frank Cervantes and disc jockey Frank Staff throughout the evening. The Haddonfield Farmers Market also had tents and products set up in Kings Court. The next ‘Haddonfield Night Market’ Food Truck event is scheduled to take place Thursday, June 8.